The eagerly anticipated All-Ireland maths challenge that has taken Ireland by storm for the past two years is back, with a prize fund of €20,000 for students and schools. Registration for students and teachers throughout Offaly is now open for LearnStorm Ireland. Originally called MATHletes, the challenge was started in 2014 by technology entrepreneur Sean O’Sullivan and Khan Academy, a not-for-profit on a mission to provide a free, world-class education for anyone, anywhere. The goal was to increase students’ competence and confidence in maths, and to date, 84 students in Offaly have participated. Nationally over 13,000 primary and secondary students have completed more than 4 million minutes of learning maths skills. The success of the Irish challenge inspired Khan Academy to take the challenge to the USA as LearnStorm in 2015. 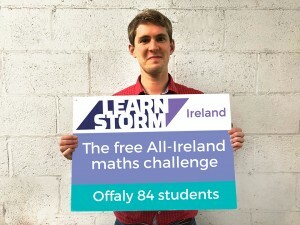 MATHletes is returning in 2016 with a new name: LearnStorm Ireland. Starting in January, students in Offaly can earn recognition for themselves and their schools by mastering maths skills on Khan Academy. At the same time, they’ll build confidence to help them learn anything. LearnStorm is free, fun and accessible from anywhere. LearnStorm Ireland has €20,000 in prizes up for grabs as students from across the 32 counties earn recognition for their class, their school, for their county and for Ireland to be rewarded for their hard work. As in previous years, students can earn invitations to finals events, which are scheduled to take place after Easter. LearnStorm Ireland is open to all students from 4th class to 5th year. LearnStorm Ireland officially kicks off on 29th January, but signups are now open. Visit learnstorm.ie to learn more and sign up today!